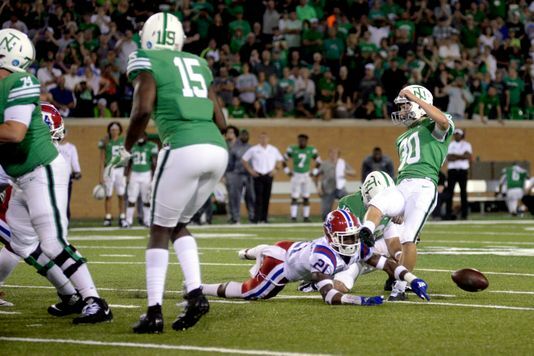 Louisiana Tech cornerback Amik Robertson (21) dives to block a field goal attempt from North Texas place kicker Cole Hedlund (30) during an NCAA college football game against Louisiana Tech in Denton, Texas, Saturday. Two prior undefeated teams in Buffalo and North Texas had home games looking to remain undefeated but both fell in games yesterday. Army and Louisiana Tech defeated those two respectively. Now just UCF (which had a big win over a Power 5 team in Pittsburgh), South Florida, who had a bye, and Cincinnati, who blew out Connecticut are the only Group of Five undefeated teams. Below are the top games of the week in my view, along with a couple bonus picks. The picks include two overtime games and a couple more that were decided in the last minutes of the games.